Basically, this is a story about some animals-turned-humans, who are suddenly faced with a problem when their mistress dies: If they don’t do something in three days to stop the spell from not working anymore, then they’ll turn back to animals. It’s a Cinderella-inspired concept, and it’s actually kind of cool?? Except for the whole, you know, furries-tragic-dead-gays thing. And I think the sad thing about this book is that 1) it had a lot of potential to be really great? and 2) I was actually lowkey enjoying it up until the ending (it would have gotten 3 stars). This aspect wasn’t actually as bad as I thought it would be, and TECHNICALLY they’re humans that used to be animals… but this was just so ridiculous it made me laugh. Me: Oh maybe the furries thing isn’t so bad!! Said furries: You don’t know what it was like. Before we were human. It was all… dark. Empty. Nothing. No purpose, no worth. My dude, my guy… the characters of a book is the most important part, in my opinion, and this book just did not have interesting characters at all. The only one I was intrigued by were three side characters (whose diverse rep was not good). Everyone else was. BORING. There’s firstly Anouk, who does not have a personality at all. She did undergo a LOT of development from the beginning to the end of the book. But it was so abrupt, and it was annoying. And it literally did not make her any more interesting. The only character that develops is Anouk. It’s not even good development. Literally all of the characters are boring and bland (except for Cricket) and they all lack depth and I’m just… why. The villain(s) were also very one-dimensional!!! No backstory!!!! Just “want to be powerful want to rule the world want to change the world for the better”!!!!! I, a teenager in high school, could write a better, more well-rounded villain!!!!! More well-rounded CHARACTERS in general!!!!!!!! I don’t even want to talk about the romance because that’s LITERALLY how little I liked it. Anouk is annoying. And irritating. And has no personality whatsoever. The love interest is annoying. And irritating. And useless. And boring. And hypocritical. And clingy. And jealous. * And has no personality whatsoever. I mean, I guess their chemistry could be how irritating they were??? Maybe they just annoyed each other so much that they thought it was hot. Or attractive. I don’t know. *I GUESS I like the love interest less. Yeah, that’s some really good stuff right there!!!! There are two queer characters: one is gay and another is a trans girl. Neither had good rep.
Basically, it was revealed that a character was gay… 310 pages into the book. Literally THIRTY PAGES LATER, he was killed off. The book is about 380 pages long. For EIGHTY PERCENT of the book, we have no idea that this character is gay. And then thirty pages after finding out, he dies. The thing is: If anyone had to die, it was logical that he was the one. But he didn’t have to be gay. He didn’t have to be the ONLY gay character. And he died as a sacrifice for the other STRAIGHT characters to live. What happened in this book is the literal definition of the bury your gays trope and I only know of one other person who’s mentioned this trope in their review. And!! as if it couldn’t get any worse!!! when it was revealed that he was gay, it was revealed that he had been and still was in love with a straight boy who would never love him back!!! He was a tragic gay!!! And whether or not it’s intentional, the message being given out to gay people is: Oh yeah you’re going to live a bad, sad life and then you’re going to die!!!! I actually gave this book 2 stars at first. But talking about the treatment of this gay character made me so angry I dropped it to 1. I’m just… no. I’m not going to deal with this anymore. And now, about the trans rep. It’s just… sigh. A prince looks into a mirror that shows someone’s heart’s desire, and it shows the reflection of a princess. Blah blah blah stuff happens and at the end the prince transforms into a princess. The thing that’s wrong with this is: It’s essentially saying that trans people, before they transitioned, WANT to be the gender that they end up transitioning to. Which is….not true. Because if you’re trans, you’re trans. You just are. There’s no want. Like: Gay people don’t wanna be gay?? They’re just gay?? Why and how is it different for trans people??? And this is getting a TINY bit personal but when I started questioning my gender, I never “wanted” to be genderqueer/fluid*. I questioned my female gender, and when I found a label that fit me, I identified as that. Finally, the last mistake in the trans rep was saying that this trans character was “born a girl”. Gender is a social construct. You are not born a gender. You’re just assigned one. And this is a concept that a lot of people can’t grasp, but if you’re going to write a trans character: do the research to get it right. *I don’t want people to get the wrong idea: Genderqueer/fluid people can be trans if they identify as trans, because they were not assigned that gender at birth! I just don’t identify as trans because it’s not something I feel comfortable labeling myself. One POC wasn’t there for 75ish% of the book and I think it was mentioned once offhandedly that they were a POC. The other POC I can’t even say for sure is a POC without looking through the book (and trust me, it would take me a long time to find where it said that the character was a POC because I can think of maybe only one time it was mentioned). First of all, the rep is so MINIMAL. Like, so minimal that those two sentences are above are literally all I can say about its minimalism. Second of all, this book is set in the urban world in Paris. If you have POC in your book that takes place in this world now, IT’S GOING TO BE A BIG THING, because race is and has always been a big thing. Mentioning the color of their skin ONCE isn’t going to do anything and it’s not good rep.
*I hate this phrase with everything in me, like “oh yeah great characters, plot, story, loved the setting, oh and there was EvEN a fAIr amount of REprEseNTaTiON!! !” Marginalized people always gonna be an afterthought huh!! The thing with this review is that I could list so many more reasons why this book was not good: The plot was uninteresting. The worldbuilding was insufficient. The writing was so dry. But with just 4 reasons (1 not being even a real one), I’m at 2K words. That’s how much this book makes me rant. That’s how bad it is. And frankly, I’m too exhausted to say anything else, because talking about the queer and POC rep in this book just makes me so tired. If nothing I say in this review doesn’t make you take the book off your TBRs, I don’t know what will. Just know that I would regret picking this book up SO MUCH if I wasn’t the only person warning people (especially queer people and people of color) away from it. :: rep :: (*upside down smiley face*) gay side character, side character of color, trans side character, possible side character of color? are you going to be reading this book? (please say no) what books do you know of with the bury your gays trope? do you know any books with furries??? RANT TO ME!! Anyways thanks for telling us about the burying gays! I would have read this but now that I know I probably won’t. WOW not only a post from may but also a post that is a rant??????? i feel so blessed. what did i do to deserve this. Oh yikes! Thanks for the warning. I’m definitely going to have to avoid this book! Wow, this sounds… beyond bad. So glad this wasn’t on my tbr! God, thanks for the warning! I absolutely hate the bury your gays trope and everything else under point 4! I’ll stay miles away from this book! I’m simply going “WHY IS THIS BOOK A DISAPPOINTMENT.” right now because I remember requesting it, looking forward to it, being EAGER to read it and now I’m all.. “thank the skies I got denied because I probably would’ve thrown my Kindle across the room.” And that’s so not worth it. Thank you for this rant – much appreciated! And also applauding your bravery for posting this because I know there are people who’d go softer on a book like this one if they’d gotten it from the publisher. Takes guts to do this! I’m so sad that an ARC did not only not work out for you, but was so horrible?? I HOPE YOUR NEXT ONE IS AMAZING. This sounds so frustrating and horrible!!! So sorry you had to read it but THANK YOU for the warning review. And better luck on your next read. I only recently discovered this book and started seeing it everywhere! I think I will skip it now! Great review. Well you may not have enjoyed this book May but I did enjoy reading your review. 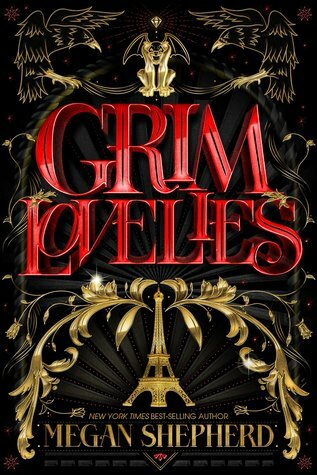 🙂 I didn’t have Grim Lovelies on my TBR list but I’m definitely not going to add it now, the premise sounds interesting but now I can’t look past the furries aspect of it all, and god I hate the ‘gays’ tropes that were used too. What was the point of introducing a character as gay just to kill them off?! The author could have left them as straight because I think bad representation is worse than no representation at all! Also the fact that he was in love with a straight character who was always and would always be straight is another trope I can’t stand, it seems so stereotypical you know, and let’s be honest the characters deserve better. Wow this is bad. The book wasn’t on my tbr anyway because from the synopsis I could tell it wouldn’t be my sort of thing, but it’s terrible that it seems like any diversity was badly done and mainly just thrown in with little care for how people who actually identify with that representation would feel about it. I love a rant post! I can’t believe I’ve never found your blog before- so good! LMAOOO I’M GLAD I COULD ENTERTAIN YOU AND DEFIED YOUR EXPECTATIONS!! !